Retargeting, a.k.a, remarketing is a marketing technique that serves relevant ads to visitors on a website based on their past behavior on the Internet and helps improve conversion rates. How to Run an effective Retargeting Campaign? Have a clear objective. The content of the ads and the overall marketing strategy will flow from it. The ultimate objective could be lead generation, customer acquisition, or fostering brand recognition. Create content that gives first-time visitors a reason to come back to a site. Have a structured content marketing program in place; so that along with retargeted ads, a website registers its presence through social media. Businesses should place a limit on the number of times in a day that a targeted visitor gets to see their ad. Businesses should use a Burn Code to stop serving ads to visitors that make a purchase. Continue to test creatives to see which ones work best. Use analytics to target visitors more effectively. Use data on demographics, age, device used, interests, region, etc to place the website audience in groups. What are the Benefits of Retargeting? The most obvious benefit of retargeting is that it helps generate sales from would-be buyers; the ones that may have paid a cursory visit to a website, but did not make a purchase or complete a desired action. Or, those that left behind a filled shopping cart. Retargeted ads place a website or a brand in front of such visitors. Essentially, retargeted ads let businesses rekindle their conversation with visitors that already have an idea of what the business is about. It helps to bring down the cost of new acquisitions. And when used as a part of a larger marketing plan, these ads bring in viewers that can be converted into clients. This brings down the cost of doing business. And, for the majority of small businesses, any activity that brings down costs and contributes to the bottom line is worth investigating. Unsure if retargeting could work for your business? Check out these stats, they might inspire you to give retargeting a try. The average CTR of retargeted ads is ten times that of regular visual ads. Retargeted ads on a website increase the chances of a targeted visitor's conversion by 70%. Retargeting enables e-commerce stores to bring back 26% of the shoppers that have left behind abandoned shopping carts. Retargeting is an opportunity for small businesses and startups to get more out of their marketing budgets. When integrated with a brand's overall marketing efforts that include content marketing, social media marketing, and CPC ads, this concept increases conversion rates and improves ROI. Businesses can drive traffic through one or more of these marketing strategies and then boost conversion rates through retargeting. Of course before starting a retargeting ad campaign – make sure your website is picking up its end of the sales process. Ensure the site visit will be a positive one for any visitor. In the same way you wouldn’t advertisers that you’re having a sale and not stock the shelves. Don’t launch the retargeting campaign until you’ve enhanced your website. 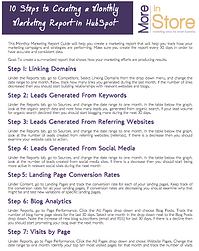 Download your copy of 25 Must Have’s to Driving Traffic Leads and Sales and we’ll point out the most common pitfalls. Spring has been terribly late coming to Nova Scotia. That’s if it’s here at all. So perhaps you’re justified if you haven’t started your spring-cleaning yet. 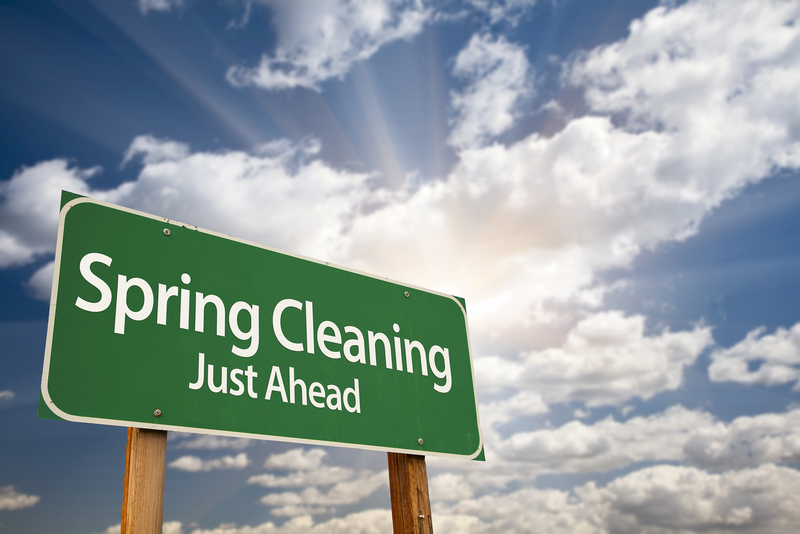 Spring cleaning isn’t just for the home – your marketing could likely use a little spring cleaning too! Just like spring cleaning around the house – the list of things you could do to tidy up your marketing is … well, endless. But I am not going to suggest you wash down every wall and baseboard, rather here are my top 7 tasks to freshen up your marketing this spring. 1. Review your goals and results. We are ¼ of the way through 2014—you still have lots of time to achieve your goals (if you wrote some). If you didn't write any – it is not too late. Create goals that can be achieved in the next 8 months or review your goals and evaluate your efforts to date. When was the last time you cleaned up your list (from your lead management tool or your email marketing tool?) Hard and soft bounces are costing you (hard dollars if you pay per contact) and they may also be causing you deliverability issues as bounces are held against you by many email providers. Did you know the age of a lead is a significant factor in the likelihood of conversion? More leads aren’t always better—old inactive leads should be cleaned out. Just like you take the garbage out now and again, it’s time to review contacts—clean out bounces, segment your lists and tidy them up. Content is king-–well-crafted content is valuable stuff. Google loves it (which helps you come up higher in search and your prospects love it too). Of course the well-crafted part of that is essential. If you have an ebook, guide, webinar, newsletter or blog that your clients appreciated at one point – there is a good chance you could repurpose it by freshening it up and putting it to work for you. Sometimes spring cleaning can be profitable if you have a garage sale with the finds. 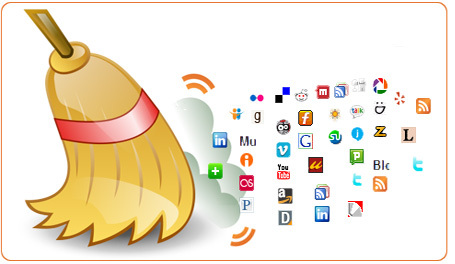 Marketing spring-cleaning can also result in savings. Review the programs and tools you’ve signed up for and cancel or unsubscribe from what you are no longer using. When was the last time you had a quick walk through your website – checking on each and every page for broken links, missing alt tags, page titles that could use a little cleaning up? Use a tool to make this tedious but important task beneficial. I use Hubspot Page Performance tool to see all my webpages in one snapshot. It highlights and prioritizes what needs my attention. Nothing speeds up spring cleaning more than team work – whether it’s the neighbor that helped rake up last year’s leaves or shared a load of garden mulch. In the world of online marketing help from other organizations often comes in the form of inbound links. Have you had a look lately to see who is sending traffic to your site? You may be surprised to see who supports you. Review your incoming links and take the time to say thanks to those who support you with a link. Are the lazy hazy days of summer right around the corner? I am not so sure, and in my business (and likely yours too) there will still be lots to do). It’s time to set priorities and refocus to make the most of the next 8 months of 2014. Do you think your marketing could be more effective? If so contact me today for a free inbound marketing assessment. Once you realize how valuable your time really is - you can let go of tasks that are not your focus or you area of expertise. In today's markets - more and more business consultants are growing their businesses by skipping the RFP (Request for Proposals) process altogether. Many consultants see RFPs as the primary way to secure business, yet it remains a time-consuming approach. For every proposal winner - there are several losers, which means those who placed a great deal of energy and time into the proposal inordinately lose money through wasted time. Instead of spending large amounts of time responding to RFPs - consider the possibility that you can showcase your effectiveness by becoming your industry's thought-leader. Why Hubspot and Inbound Marketing? Inbound Marketing is all about giving away quality helpful content and becoming a thought-leader in your industry -- while attracting prospects along the way. Lead-capturing content is the most dynamic approach to permeating your industry with your presence and knowledge. Hubspot offers all of these powerful insights - just one click away , what’s even better is you can glen this info on your top 10 competitors in one snapshot, as well as highly detailed information about each website visitor. Inbound marketing is all about building relationships. It’s about helpful, timely information getting to prospects when they need it most. Anytime you succeed at building your prospects’ trust - you then become a thought-leader. This means when your prospect needs your services - you are the first one they think of. Building trust with your prospects remains the core of building quality relationships. With inbound marketing, your thought-leadership material is always online anytime a prospect goes looking. Through blog posts, ebooks, FAQs etc. - SEO rich, professionally written content is offered in exchange and with an easy process for a prospect to offer up pertinent information - such as email addresses. With powerful marketing insights at your finger tips. If you are ready to enter the world of high-technology coupled with proven marketing strategy - contact More In Store now to get your free inbound marketing assessment. Your company website is one of your most important assets. Done right, it will be found by a wide spectrum of prospective and current customer alike, and, it will make your business shine, giving prospects and customers the information they need to do business with you, and also tell others about you. Creating and maintaining an amazing site requires unique content written specifically for YOU. Many companies offer to simplify your website creation process by providing turn key templates, including pre-written text. I see this very commonly in the health sector – websites designed for dentists, physiotherapists, vets etc. These providers tell you they know your industry and have realized success in your industry in other markets. While their offer to serve you up pre written content may help you to turn on a live site pronto, you can and should do much better than this. Your business deserves better than generic content and worse yet, Google doesn’t like duplicate content and your site will not rank as well in Google if you use this approach for a website development. Investing in unique content is always worth the time and money. Take the time to understand who your target audience is and speak to them in your own words, they’ll appreciate it and you’ll appreciate the higher search rankings by staying away from duplicate content. Social media success isn’t defined by the number of LIKEs you have on Facebook, or the number of followers on Twitter. Effective social media marketing is about using social media to grow your business. You need to get beyond LIKEs and start creating LEADs. It’s easy to create BUZZ with social media, but the magic happens in the next step – moving prospects down the funnel and converting them to leads and then customers. Getting from LIKEs to LEADs requires a strategy that helps move people through the sales cycle with effective call to actions, landing pages, conversion forms and more. Consider downloading, Download The Social Media Tune-UP: 3 Step Process to Effective Social Media Accounts. Enhancing your social media presence will be as easy as 1-2-3 with this free guide. Are your marketing efforts still back in the 1800s? Technology has made tracking marketing efforts so much easier. If you don’t have Google Analytics or another web site tracking tool, get it on your website right away. Google Analytics is a free tool and it can provide you with tremendous marketing insights. Make sure you are gathering marketing data at every possible point and take the time to analyze the results. After all, you can’t improve what you don't measure. Do you know who your target audience is? Do you know him or her so well that you have a clear picture of her, do you know demographic and physiographic details? This great blog article by Hubspot provides details on how to incorporate physiographic into your marketing http://blog.hubspot.com/insiders/marketing-psychographics Getting clear on your customer will greatly increase the effectiveness of your marketing efforts. 5. Caught in old marketing practices that are eating up your resources? Marketing is changing and evolving. Some tactics like networking and the value of positive customer feedback have stood the test of time and will always be a part of effective marketing in one form or another. But some practices should be retired. Maybe it’s a social network that you jumped on sometime ago, but now with your well defined target audience you know your customers aren’t even on that platform. Perhaps you’re churning out meaningless reports just because somebody is used to getting a certain report the old fashion way every Tuesday. Take the time to review your marketing efforts and ask yourself if each of them are making a difference or are some just being done because that’s the way you’re used to doing it? Why not download a copy of our free ebook, 10 Useless Things to Cut From Your Marketing and see what time you could free up for marketing tactics that could positively affect the bottom line. Have you been caught by a marketing pitfall? Share your experience below in the comments section. For most businesses, marketing is a necessary expense ensuring they keep top-of-mind with prospective customers. 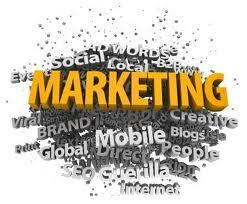 Marketing expenses often run 5 -10% of projected sales, or more depending on the marketing objectives. Deciding on a marketing budget and how to allocate the budget is a challenge for business owners and marketing professionals alike. As I meet with prospective clients (and existing clients) I hear a theme of pitfalls that have caught many businesses. 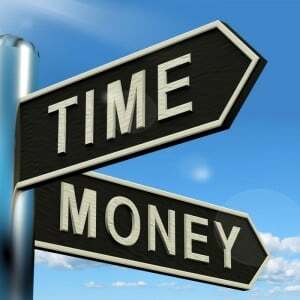 With little time to allocate to marketing, planning it is easy to be ‘sold a bill of goods’. After noticing a theme of common pitfalls I was inspired to create this blog, shedding light on some of the common ways businesses have spend their marketing time and funds, that are not likely to further their awareness. This first blog post recaps just 4 of the common pitfalls I come across. 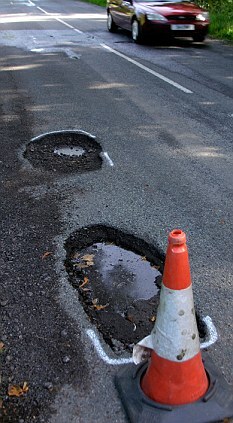 This blog post will be a two part series because, unfortunately, there are as many marketing pitfalls as our Nova Scotia potholes after a long hard winter…. 1. If it seems to good to be true… it probably is. I’ve heard many clients tell me of companies that promise to get their site ranked number one in search for a nominal monthly fee – either a cost per word or a monthly subscription. Search Engine Optimization (SEO), is well worth the investment, but optimizing your site for search isn’t usually effective with a “pay up and forget about” it strategy. Coming up high in Google’s search results is all about having up-to-date quality content on your site—like the right content, links, optimized pages and more. This blog post by Hubspot, Answers to 18 SEO Questions You Were Too Afraid to Ask, addresses many questions that I am regularly asked by clients. But as a rule of thumb, I’d steer away from a proposal that sounds too good to be true. Market takes work! Technology is a marketer’s best friend. The right tools can allow you to send scheduled targeted emails, test headlines and call to actions, track your efforts and so much more. Whether its email marketing, social media monitoring or scheduling, there are dozens of apps, tools and programs to make you into a marketing genius. But not all tools are created equal, and once you upload your list, or customize a template, switching to another tool can be a challenge. Over the years I’ve used a long list of different free and paid tools to realize my marketing goals. There are without a doubt some amazing free tools; Google Analytics would be top of my list. But each tool that you embrace takes some time to learn and to customize for your business. Choose your tools carefully and consider not only the monthly cost, but the associated cost of the time it will take you or a team member to learn the tool. My favorite marketing platform is Hubspot, this all in one solution is the same platform for all marketing functions: landing pages, blog posts, emails, search engine optimization, social media monitoring scheduling and more. The time I save using Hubspot is well worth the monthly subscription cost. Getting into it for the wrong reasons – because the competition is doing it, or somebody else has had great success with it aren’t strategic reasons for getting into any marketing tactic. Your social media efforts need to be strategic and supported by a larger marketing goal. Taking on too many platforms – the only thing worse that no social media presence is having a profile that is no longer updated or being monitored. Figure out where your customers are (Facebook, Twitter or LinkedIn are all great tools to start with) master one tool and then embrace another. Assuming Social Media is a free marketing tool – while a presence on social media is free (or there are minimal hard costs) the human capital should be accounted for. Social Media marketing can be time consuming (especially so if you aren’t trained in it). Next up, I’ll be looking at other common pitfalls including: website building tools, more on social media, reviewing results, reactive marketing and more. 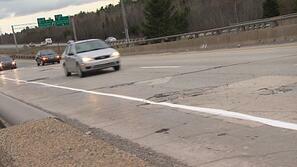 Has a different marketing pitfall put you off track? Share the details in the comment section below. Looking to get more out of your marketing? Contact me. Visual content is vital in creating and maintaining your brand image in social media. All social media outlets give their users an area to upload an image that represents them… and in business’ cases, a photo that represents their brand. These images are the first thing a visitor to your business’ social media page will see. Creating a compelling cover image is a key step for any business’ social media strategy. With cover photos on sites like Facebook and Twitter, you’re able to express your brand, create awareness around a new product, or even showcase a major business milestone (like an anniversary). A cover photo must be sized correctly for that space, or you’ll notice some distortions that take away from the overall look. If you’ve added content on a cover photo image you’re uploading to social media, you want to make sure that the overall image is the right size. If not, you’ll notice that the cover photo is either resized, warped or cropped and ultimately looks distorted, making whatever you’re trying to show with the cover photo hard to look at. In order to avoid the image distortion when your photo is uploaded, you’ll want to make sure that you create the original image to the correct dimensions for the social media platform. For example, if you create a cover photo for Facebook that is 1000 pixels wide by 500 pixels tall, you’ll notice once you upload that cover photo, only half of that photo will be visible. So all of that valuable and important content you placed on that cover photo for your current and prospective customers has been lost. With this free guide, you’ll be able to make your cover photos for Facebook, Twitter, LinkedIn and Google+ the correct size, every time. You’ll learn all of the dimensions, and be able to keep this download on hand for referencing. We encourage you to download it, print it off, and keep it handy to you and anyone else in your business that is responsible for making you look good on social media. Click below to download the free “Social Media Cover Photo Guide” now! Marketing, smarketing: How well are you doing it? When it comes down to the nitty-gritty, Internet marketing can be a pretty daunting task. Social media is essentially free, but the time required to do social media can cost you manpower. In today’s business world, most businesses are found on social media and that’s the first point of contact for many. Social media has become a necessity to run a successful business. At this point, it’s not a matter of if you are on social media; it’s a matter of how well you do on social media. In this fast-paced world of digital marketing, and the ever-changing features on social sites like Facebook, Twitter and LinkedIn; it’s hard to keep up. Now, although this has made marketing easier, it has led the way for marketing to be a little disorganized. Are you focusing the right efforts towards the right things, to target the right people? As the marketing tools have changed, so has the way we need to go about marketing. Many businesses are still implementing old practices that are hogging resources and not yielding the best market-driven results. Let’s bring it back to the basics. We want to concentrate our efforts to one specific, overseeing objective: We want to turn prospects to visitors, visitors to leads, and leads to customers. 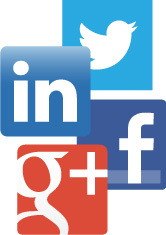 By starting with social media, we can lure in our prospects and begin the conversion process. So, what do we need to do? By blogging, posting on social media outlets, and interacting online with your publics and like organizations, you will be able to build new and nurture existing relationships. Knowing how to do it properly will save you time and money, and even make you more! 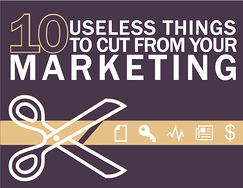 With this new guide, 10 Useless Things to Cut From Your Marketing, you will learn ten things a lot of marketers do while marketing that are now outdated tasks, serving no value to their business. 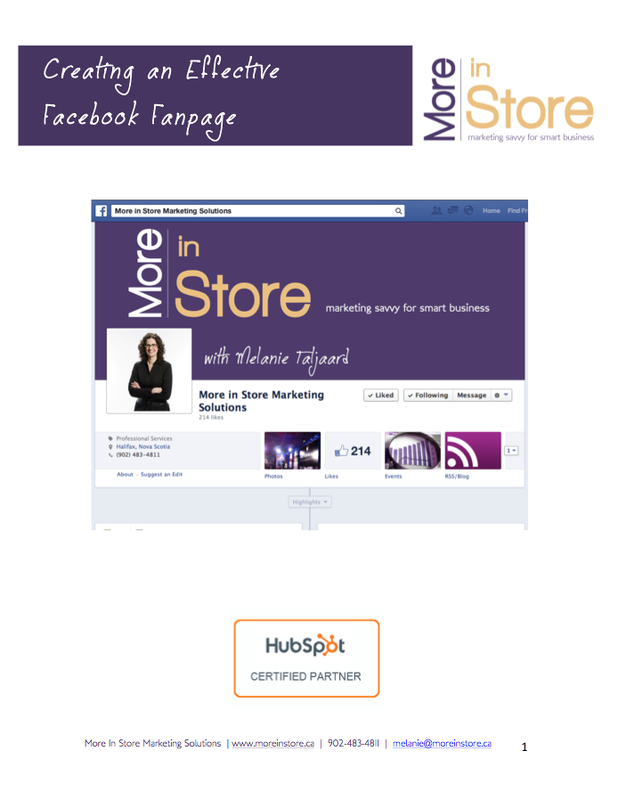 Download this FREE informative eBook from More in Store Marketing Solutions today! Click below. Did you set a business resolution with the New Year upon us? We are two weeks into 2014, behavioral experts say it takes three weeks of an activity to become a habit, so if you’ve made changes to your marketing at the beginning of the year, you should be well on your way to creating some sustainable new practices. Despite the best New Year’s resolutions, reality would have it; most of the successful entrepreneurs I work with do not have the time to devote to their marketing efforts. It’s not that marketing isn’t important to them; it’s rather they understand the value of working with an expert to achieve their marketing goals that otherwise may only receive sporadic attention. If you are active in social media, you know that the platforms area always changing. Take for example cover photos. When Facebook first launched cover photos, there were many restrictions on what businesses could put on them. Those restrictions have been lifted, but have you had a chance to update your cover photo—giving it the attention it deserves? Are you up to date on what makes an effective cover photo while following Facebook guidelines? Last year one of the most popular downloads from my website was Creating an Effective Facebook Fanpage. This guide helped many businesses enhance their Facebook Fanpages and helped others to realize that they’d rather outsource their social media presence to an expert. With more than 1.19 billion active monthly users, Facebook has become the new word of mouth (or perhaps words of mouse). Done right, Facebook makes it easy for others to learn about your brand and for people to tell their friends about you. Chances are, your best clients’ friends would likely also make amazing clients for you. This important marketing platform cannot be left to chance. Just because the boss’ teenage daughter is always on social media, doesn’t mean she is equipped to create and manage an effective Facebook Fanpage. Many small business owners are tempted to delegate social media to the person ‘who is on social media’. While being on Facebook may give you the comfort of how the tool works, Business Fanpages have many unique features and apps. Understanding the nuances of a Facebook Fanpage and the special features to market your business on Facebook can set you apart and create a wonderful online presence for your prospects and customers alike. A lot has changed since I first launched the Creating an Effective Facebook Fanpage – Edgerank is no longer, and you’ll find the info now under Facebook’s Algorithm. Many marketers have been noticing a decline in the reach they can achieve following Facebook’s changes. Understanding Story Bumping and Last Actor sheds light on how Facebook chooses to serve up content and how you understanding these recent changes will allow you to make the most of every post you publish. Even if enhancing your Facebook Fanpage isn’t on your list of marketing tactics for 2014, take a moment and download this free eBook. I’m sure you’ll see the benefit of Facebook Fanpages working for YOUR business. Consider a website an asset—something you invest in and build to serve your marketing and communication needs today and well into the future. A website is your marketing castle—and just like you’d build a castle with a vision, you should do the same for your website. Chances are your website will be a new customer’s first interaction with your brand. When you hear about a new service or product, chances are your next step is to look it up in Google and your potential customers are likely to do the same, right? If you believe this to be true, what are you doing to build and enhance your marketing castle? Do you like the structure and flow of your website? If not, start dreaming and planning a website that really represents who you are and what your clients need to know about you in order to do business with you. Once your website (or marketing castle) is built, you will need to continue to enhance and maintain your website as your business evolves and changes. A website is certainly more dynamic and easier to enhance than a castle. Chances are you’ll get lots of offers to help you enhance your website. Companies will offer to improve your search engine optimization (SEO) promising that you’ll come up number one in Google for certain keywords. Perhaps, they will offer linking strategies that make your site come up higher in the search bar. If these strategies or proposals sound too good to be true, they probably are—like the swamp water land you could buy in Florida, not the ideal place to build a castle! Sometimes these offers to ‘fix’ or ‘enhance’ your website or SEO placement are a bit more polished and slick and perhaps you’ve even been tempted to give these offers a try. After all, you are juggling a gazillion things and quite frankly, it would be nice to tick marketing or website enhancements off the list. When you are evaluating the merit and value of these pitches here are a couple of indicators that you should stay away from and a tip to help you evaluate the vendors to see if they will really deliver on what they promise. I hear a lot of companies offering to build profiles or to create pages on their site for your company, promising to maximize its presence. If the provider is talking about giving you a profile on their site it isn’t going to help you nearly as much as if you enhance your own site. Quite often these companies promise profiles that are ‘mini-sites’ loaded with features but your content is of most value, for both search optimization and user experience, if it lives on your own website. Web visitors may be confused if they see info on a ‘profile’ and then different content on your ‘website’. Many of these providers try to create a mini site that mimics your site. The visitor may not, in fact, know they aren’t on your site. This leads confusion if they see a different web presence each time they search for you. Rather sophisticated companies are taking this approach of creating mini-sites and profiles for companies. Yellow Pages and Roger’s Outrank are taking this approach. Invest in your own site, not a profile on another company’s site no matter how smooth and polished a presentation. Your presence on their website is actually helping their site far more than it is helping you. It is kind of like paying them rent – helping them to pay the mortgage on their castle and doing very little for your own castle. Build ONE castle – not a house with many add-ons and out buildings. Have you found yourself at a cross road of knowing whether you need one site or several sites. Perhaps you have multiple service locations—do you give them all their own sites? I have pondered this question and asked many web experts opinions. Perhaps their answer will be obvious to you! You want to build one marketing castle, not a house with lots of outbuildings. A website will come up higher in search results based on many factors but the volume of relevant content, number of incoming links and age of the website all contribute to your placement in search. You can actually be penalized for duplicate content on sites. It takes less time to build one quality site and serves you far better in the long run than maintaining many sites. Often companies have several URLs (or web addresses) and that is the reason that they build or keep many websites, but you can easily redirect web users from other URLs to your marketing site – the user won’t even realize they are being redirected and you’ll be building one strong marketing castle. Coming up high in search engines takes time. Some of the top results in Google are pieces of content that were posted sometime ago. Just like you can’t build a castle over night you can’t get to be number one in Google overnight. If somebody has promised you overnight success it is probably too good to be true. Buying Google Adwords can get you to the top practically overnight, but you are going to pay per click (this can be a good plan if it fits your strategy). While Google Adwords can put you on top overnight, many people choose organic results over the ads. Investing in true SEO doesn’t cost you per click. If you’re considering a provider to help you with website enhancement or SEO, ask who they’ve helped before – get client names and see how those companies perform in search for keywords you’d use for those services. Let the work these companies have done for other companies speak for them. Looking to see how your website or SEO measures up? Contact me for a free Inbound Marketing Assessment.